Intervals is web-based project management software that marries time tracking and task management in a collaborative online space with powerful reporting. Intervals is ideal for small businesses — including designers, web developers, consultants, creative agencies, IT services firms, and communications companies. 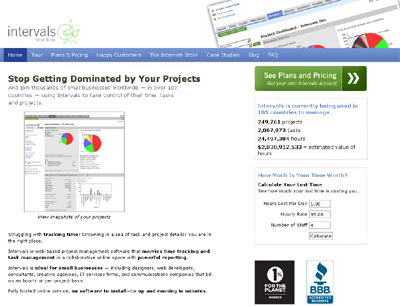 Intervals integrates time tracking, task management and project management from the get go. None of these three features are an afterthought. In addition, Intervals was built by experienced web designers and developers and has a great understanding of how creative and development projects should be managed.